Scripture about binding the strong man: Luke 11:21-26 21 When a strong man armed keepeth his palace, his goods are in peace: 22 But when a stronger than he shall come upon him, and overcome him, he taketh from him all his armour wherein he trusted, and divideth his spoils. 23 He that is not with me is against me: and he that gathereth not with me scattereth. 24 When the unclean spirit is gone out of a man, he walketh through dry places, seeking rest; and finding none, he saith, I will return unto my house whence I came out. 25 And when he cometh, he findeth it swept and garnished. 26 Then goeth he, and taketh to him seven other spirits more wicked than himself; and they enter in, and dwell there: and the last state of that man is worse than the first. When doing deliverance ministry, it is important to deal with the goods to get to the strong man. For example, ministering to someone with a spirit of bitterness. You would need to address the demonic spirits related to bitterness. Bitterness is the strongman. Accordingly, you would cast out unforgiveness, resentment, retaliation, anger, wrath, hatred, violence, murder with the tongue, rebellion, etc. Once you remove the goods, according to Luke 11:21-21, then you can cast out the strong man of bitterness. 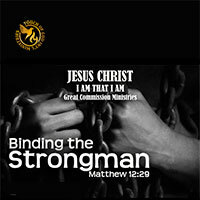 You will learn more about casting out the strong man through this audio teaching.